OK, here’s a different kind of tourist experience, after seeing all these historical sites. After we left Jaipur, India, we flew to Amritsar. Jaipur is known for several tourist attractions, but Amritsar is only known for a small number. 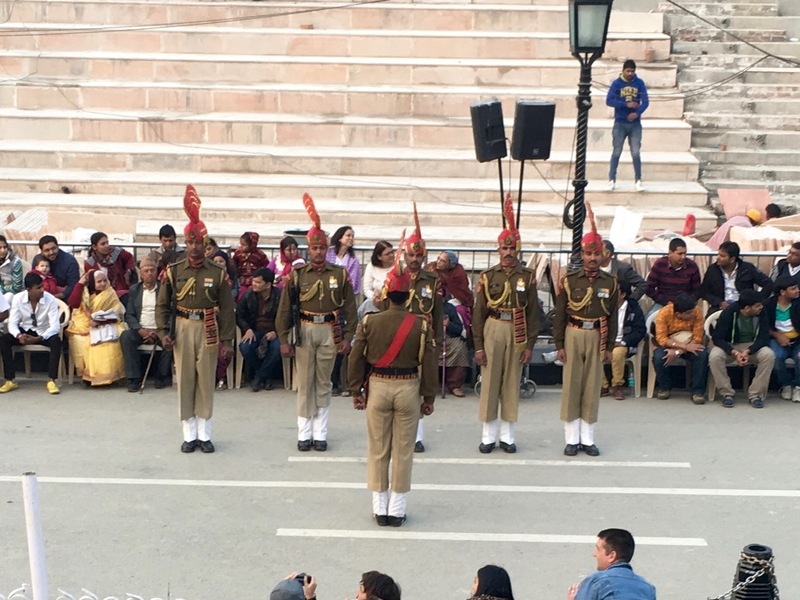 And the one that appealed the most to me is the Wagah border ceremony. So that was the first thing we did. Quick simplified history lesson for people who don’t know anything about India: England was in control of India for a long time, and for much of that time it was larger than India is today. Around the time that India finally gave the English the boot, there was also great strife between the Muslims and the Hindus and the Sikhs. The Muslims wanted their own country, and after a bunch of nastiness, they got it. That was called Partition, and it happened in 1947. That’s when Pakistan separated from India. In general, Muslims went to one side of the border, and Hindus and Sikhs went to the other. The cities of Amritsar and Lahore were at the center of the skirmish, and the end result was that the border was drawn between the two cities. Lahore would become the capital of the Pakistan side of Punjab, and Amritsar would become the capital of the Indian side of Punjab. Incidentally, in addition to the several hundred thousand people killed as part of the genocide, “UNHCR estimates 14 million Hindus, Sikhs and Muslims were displaced during the partition; it was the largest mass migration in human history,” according to Wikipedia. Then and now, there’s a major highway and rail line that connect those two cities, and so the border crossing was and still is a big deal. The rail station at the border is at a town called Wagah. And every night the border closes at sunset. 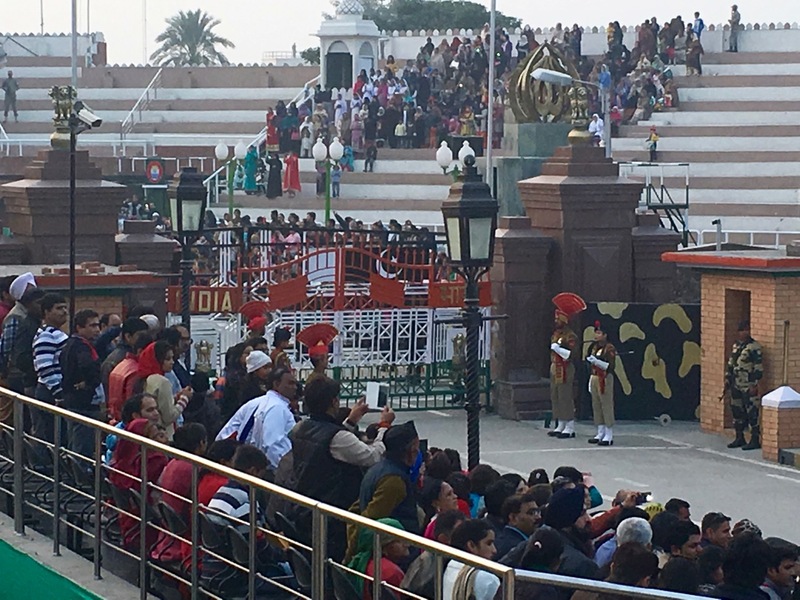 Over the years, a ceremony has formed around the closing of the border, with the Pakistani border guards and Indian border guards both trying to outdo each other. Eventually tourists from both countries started coming to see all this. 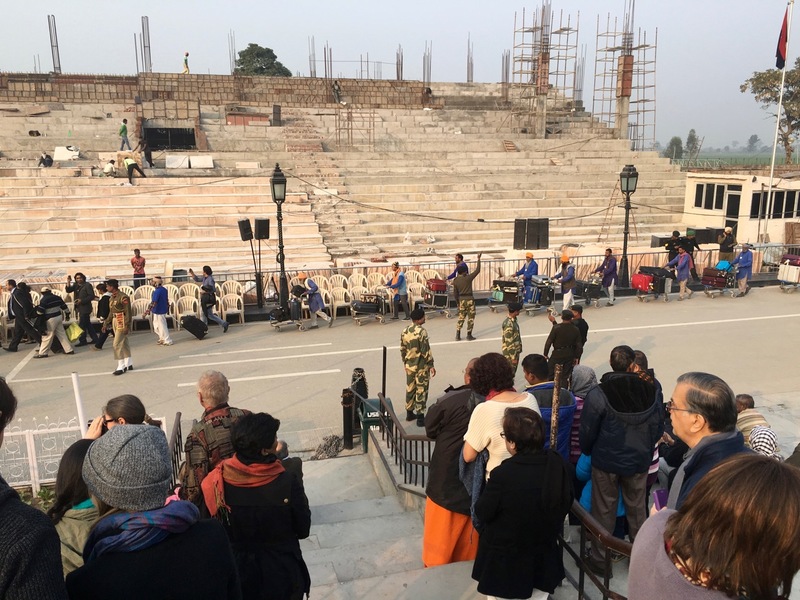 Even though relations are relatively calm right now, the big border ceremony is a point of national pride for tourists from both countries. Our sightseeing adventure started with hiring a driver to take us out to Wagah. He would wait for us during the ceremony, and then bring us back to our hotel. The drive out there was about an hour long, and we just enjoyed the scenery as best we could. He dropped us off at a cold drinks stand and said to come back here when we’re done. 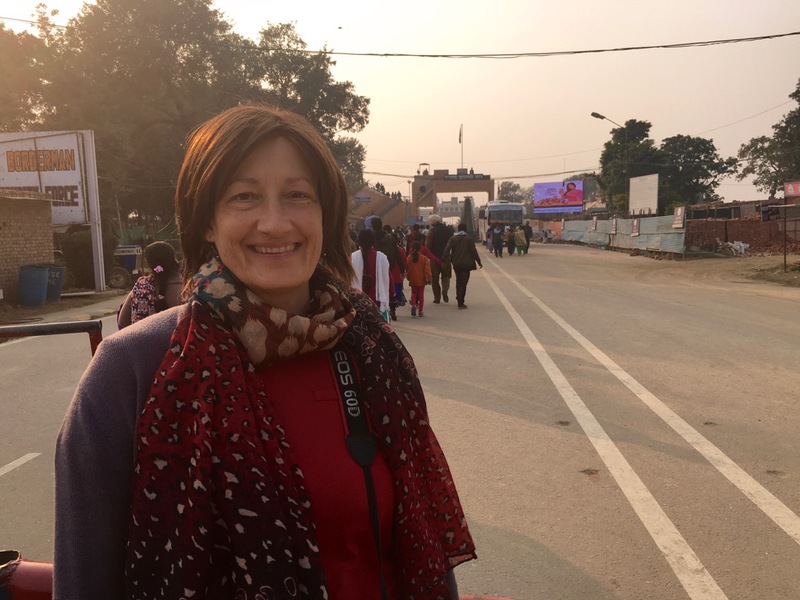 I was careful to write down the name of the place, because the last thing I wanted is to be lost in India near the Pakistan border in the dark, not being able to speak any Hindi. As foreign tourists, Beth and I were treated differently than the Indian tourists. There are grandstands on both sides of the border, including some new ones under construction on the Indian side that weren’t open yet. Attending the event was free, but we were put in our own seating section for foreigners. The view was slightly better than the much larger seating section for the Indians. We also had our own separate security and bathrooms. That was kinda weird. It’s too bad the seats across the road from us were under construction. They’ll hold a lot of people pretty close to the action when they’re done. But for now, all the people on the Indian side of the gate (which is off to the left) are on this side of the road. After a long while, they were sent back to their seats and the real border ceremony began. There was a bunch of marching, with soldiers making incredibly high steps. I guess to be in the border patrol you have to be able to kick your feet up to the height of your head when you march. The uniforms were great. Some of the people had swords, and others had guns. But I have a feeling those guns weren’t loaded, since I noticed there were some other border guards in a very discreet machine gun emplacement overlooking the whole scene from a rooftop. This shot to my right shows all the Indian visitors. They were a boisterous crowd. One thing I noticed was that the border guards were a mix of men and women. Most were men – very tall men, in fact. But there were a few women in the group as well. I can’t say if the same was true on the Pakistan side, since the border gate blocked my view. It’s hard to tell from my crappy photo, but the shot below shows a pair of male troopers with red peacock hats, and then next to them are a pair of female troopers with smaller black hats. After a long period of shouting and high stepping really fast marches, all the guards were in position. Then, both sides started to lower their respective flags at the gate. Then most of the guards retreated. The last remaining guards, one on each side, then shook hands in a very exaggerated and crisp way, and then saluted each other. Then they turned and marched off, and the remaining guards closed and locked the gate. And then it was over! The border is now closed for business, until tomorrow. The flags are now being brought down. In the stands behind the Pakistan flag are some of the visitors on the Pakistan side of the border. To do the whole event justice would require a really long telephoto lens, which I don’t have. And that night I didn’t take my good camera – only my iPhone – because I didn’t want to be weighed down with an expensive target around my neck in a big crowd. So my photos are just so-so. 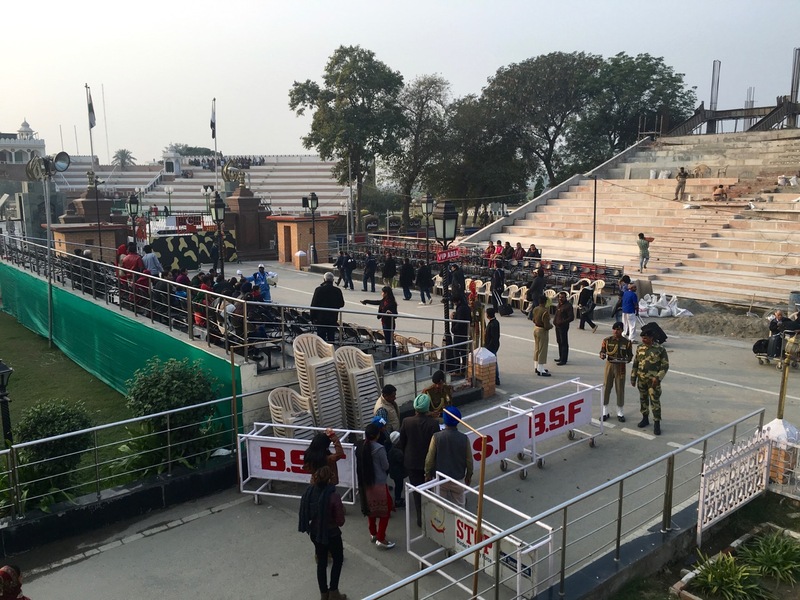 If you’re interested, I encourage you to go check out one of the professional videos of the Wagah border ceremony that you can find online. 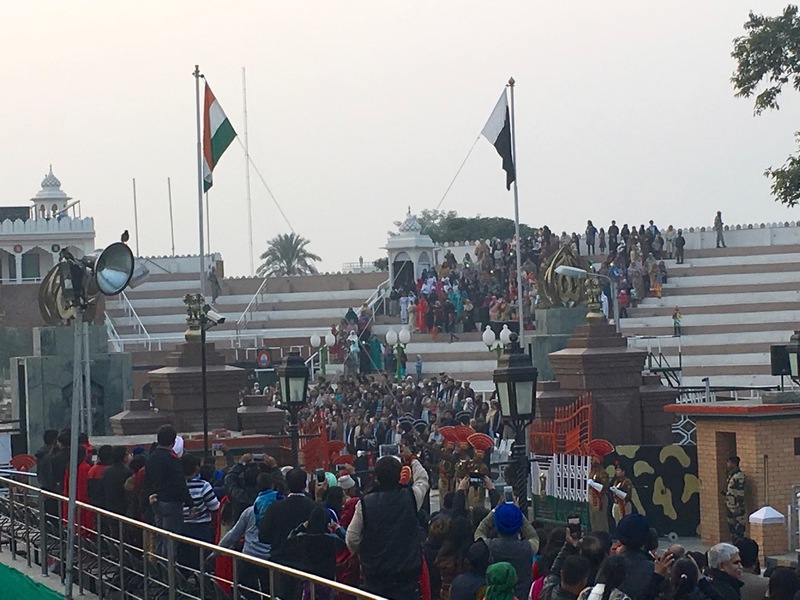 Side note: At the Wagah border ceremony, we were only about 100 meters from the border. 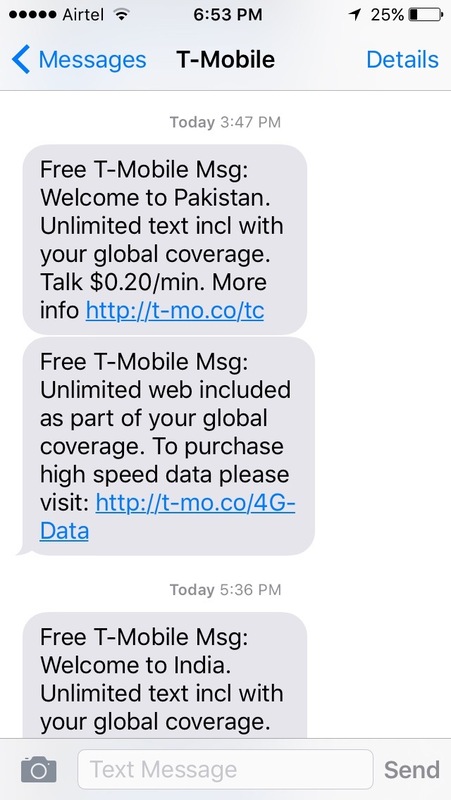 Apparently my mobile phone latched onto a cell tower across the border, because T-Mobile sent me a text saying, “Welcome to Pakistan.” We didn’t go to Pakistan on this trip, nor did we have any desire to.